Depression and Anxiety Treatment in England: Does the level of care depend on where you live? Taking into account the increased awareness and the prevalence of mental health problems in England, we thought it would be interesting to investigate the quality of the treatment of those who present to their doctors with mental health conditions; we’ve investigated Depression and Anxiety. The data provides some demographic data including age range and gender. Analysing the data provides some interesting insight into the level of care in England and the regional differences that can be seen. We see the raw numbers of those presenting with the conditions can vary greatly from region to region. For example in Hertfordshire there are 137,848 people presenting with these conditions, compared to North Lincolnshire which only shows 13,460. This will partly be due to the differences in population, but also the rate at which people present to their health care providers for help. What is interesting is the percentage of those referred for treatment can vary highly. In North Lincolnshire, where there are fewer people presenting with these conditions, you are more likely to be referred (8.14%), and subsequently attend treatment (6.97%) compared with Hertfordshire where only 3.34% are likely to be referred and 1.37% attend treatment. The data visuals used to illustrate this information shows the top 5 care trusts for treatment rates compared to the bottom 5. This starkly depicts the difference in the level of service you might receive depending on where you live. Alongside the visualisations that show these findings we also created a visual that combines the percentage of those referred with the percentage of those actually going through treatment to create an ‘action taken’ percentage for each care trust. Through this we can see the PCTs that are most active in treating their population who have the conditions. In this indicator, North Lincolnshire comes out top with 15.11% referred or treated followed by Walsall Teaching with 14.33%. At the other end of the scale is Hastings and Rother PCT who unfortunately referred or treated 0% of their 18,300 population with the conditions. Hillingdon is next lowest with just under 2%. Further analysis reveals there are also discrepancies between the level of care between the genders and age ranges. It is not clear however, whether this is due to the potential differences in the likelihood of different age ranges and genders seeking help and treatment from their GPs. Of those who receive treatment, 64.32% are women compared to 35.28% who are men (in this data set 0.5% of patients have their gender recorded as unknown or not stated). Similarly, there are differences in the likelihood of certain age ranges to be receiving treatment. Whilst preparing this report, we also found that one of the regions that was most likely to refer or treat their population (Northumberland Care Trust, 11.48%) for depression or anxiety was also marked out as one of the two ‘Outstanding’ care trusts by the Care Quality Commission in their report The State of Care in Mental Health Services (2014 to 2017). The report designated the care trust as outstanding in overall mental health services not just for the specified conditions. As such, this could indicate that the concerted effort to improve the standard of mental health care in that PCT has improved the likelihood of being referred or treated for the specified conditions. The figures found in the data set and analysed through visualisation in Power BI do point to a service that is clearly under pressure. This can be seen from the discrepancies between the quality of service seen throughout England. It does seem to indicate that where you live could affect the care you receive with regards to depression and anxiety. 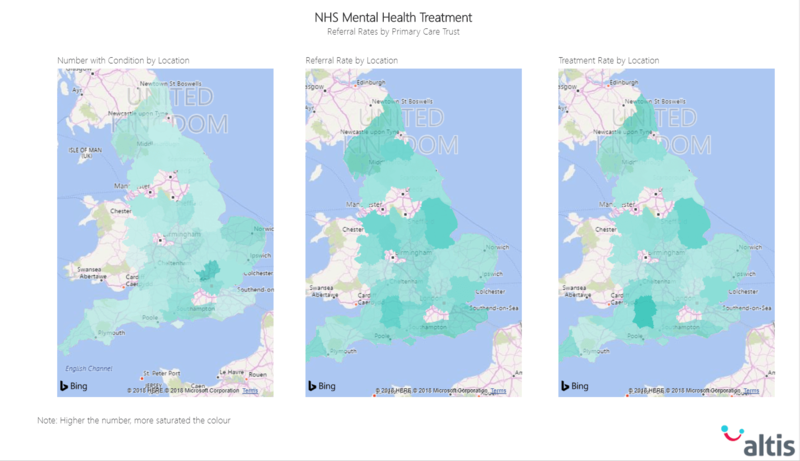 The NHS, through the Improving Access to Psychological Therapies (IAPT) Programme (who were the initial recipients of this data set) are looking at ways to improve access to care (https://www.england.nhs.uk/mental-health/adults/iapt/) and we hope that this initiative will even out the service levels across the country.